Mocking the JDS-Congress coalition government in Karnataka as "helpless" with Chief Minister H D Kumaraswamy becoming a "punching bag", Prime Minister Narendra Modi Sunday said the Opposition wants to impose the same model on the country. 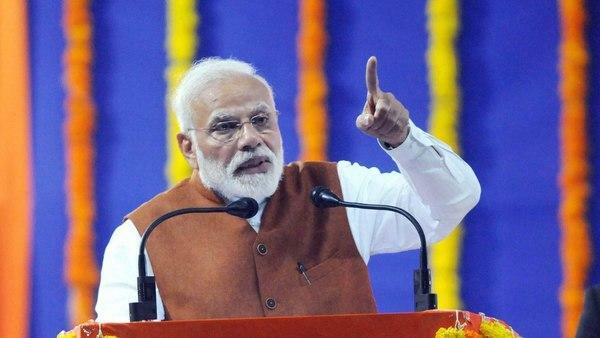 Modi said there was not even a single day "when the country doesn't see the Natak (drama) of the government", as he launched BJP's campaign for Lok Sabha polls here in the party's stronghold of north Karnataka. The Prime Minister, whose visit comes amid the political turmoil in the state, with BJP being accused of trying to dislodge the coalition government, took potshots at the ruling alliance in the state, saying "everyone is involved in saving their seat." The visit also comes when BJP state unit chief B S Yeddyurappa is at the vortex of a row after the chief minister released an audio clip of his purported conversation to lure a JDS MLA through his son in his alleged toppling game. Yeddyurappa has dismissed the audio clip as 'fake.' "MLAs are fighting at hotels and breaking their heads. Several Congress leaders are fighting for their supremacy," Modi said, apparently referring an alleged brawl between Anand Singh and J N Ganesh, seriously injuring the former. The turmoil has seen both BJP and Congress camping their MLAs at resorts and hotels to prevent poaching bid and several wayward Congress lawmakers keeping the party on tenterhooks skipping the assembly session and legislature party meeting. "Publicly, he weeps about his helplessness (mazboori). Such helpless government, such helpless Chief Minister who is being challenged by anyone and every one. Who is the in-charge of the government. There is confusion about it," Modi said. Setting the "mazboor versus mazboot" narrative, the prime minister said, "Karnataka's helpless model" was being sought to be imposed on the country, scoffing at efforts of the opposition parties to cobble up a "mahaghatbandhan" (grand alliance) against him. "...They want to impose it on the country. Such a helpless model where the head of the government keeps weeping at the corner and decisions are taken in naamdaar's palace...they want confusion and fight for power to continue and the world laugh at the country. They want to impose this model on the country," Modi said. The Prime Minister said the "New India" wanted a model that was strong and not a model that was helpless. "Every single vote of yours will decide whether therewill be honesty or dishonesty, progress(vikaas) or dynasty (vanshwaad), whether there will be positivity or negativity. Whether you want clarity orconfusion. The answer to this questions will decide our destiny" he said. "You are witnessing in Delhi who all are falling in line...about whose income people used to fear talking.They are made to make their appearances before court and agencies and answer questions. They are giving an account of their benami properties in the country and abroad," he said. He was apparently referring to Robert Vadra and former Union Minister P Chiadmbaram's son Karti appearing before probe agencies like the Enforcement Directorate. Modi also launched projects worth Rs 5,000 crore, including the Strategic Petroleum Reserve Facility that includes 1.5 million metric tonnes reserves at Mangaluru (Rs 1227 crore) and 2.5 MMT at Padur (Rs 1693 crore) in Udupi district to ensure energy security. He laid the foundation stone for the Indian Institute of Technology at Dharwad, near Hubballi, a 470 acre "green, smart campus" with state-of-the-art infrastructure with provision for UG and Doctoral programmes in multiple streams. Modi also laid the foundation stone for Indian Institute of Information Technology at Dharwad was also laid. The "world class" IIIT will come up on a 60 acre land with public-private partnership for UG and doctoral programmes in IT and related areas.